Welcome to the home of Krumb. 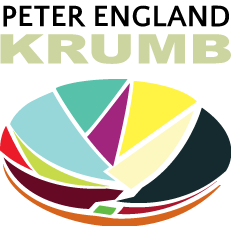 Krumb Design has been offering graphic design and website services for over fifteen years. Founded in London by Peter England it moved to Oxford in 2009. Krumb offers businesses a full range of design services from initial branding, logo and business card design to brouchures and other promotional materials as well as website design. Using the WordPress publishing platform and the latest responsive themes Krumb combines eye-catching design with a clear understanding of the clients business needs to create elegant client led websites. Peter England studied painting in Brighton before becoming a co-founder of the design agency Outer Space. Peter continues to paint and make sculptural works as well a decorative pieces using Calabash bowls.